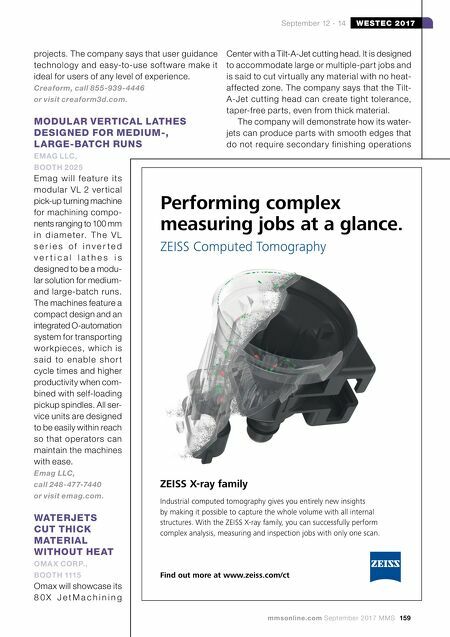 158 MMS September 2017 mmsonline.com WESTEC 2017 September 12 - 14 METROLOGY SYSTEM MEASURES LARGE-SCALE PROJECTS ACCURATELY CREAFORM, BOOTH 1040 Creaform's MaxShot Next is an optical coordinate me asur ing syste m de signe d for large -sc ale product development, manufacturing, quality control and inspection metrology projects in aerospace, automotive, transportation and heavy industries. It is said to offer excellent measure- ment accuracy and repeatability for large-scale method. PrimeTurning is said to provide higher metal-removal rates, produc- tivity gains and increased tool life in a variety of materials. Mastercam's CAD functions support machin- ing. Angle Sweep improves the creation of more complex wireframe functions. When creating or editing primitives, there are now on-screen sweep and rotate controls, which can snap to the Auto- Cursor positions of existing entities. 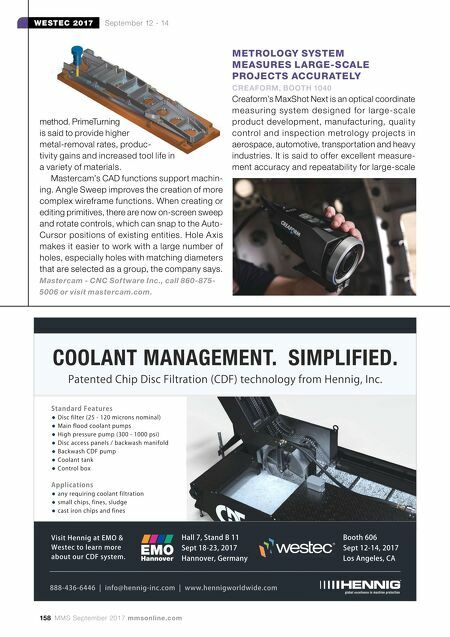 Hole A xis makes it easier to work with a large number of holes, especially holes with matching diameters that are selected as a group, the company says. Mastercam - CNC Software Inc., call 860-875- 5006 or visit mastercam.com.